Record Auction For Christie's New York? An auction of Impressionist and other modern works in New York next month may become the most lucrative art auction ever, The Times Online reports. The November 8-9 auction could fetch $490 million. 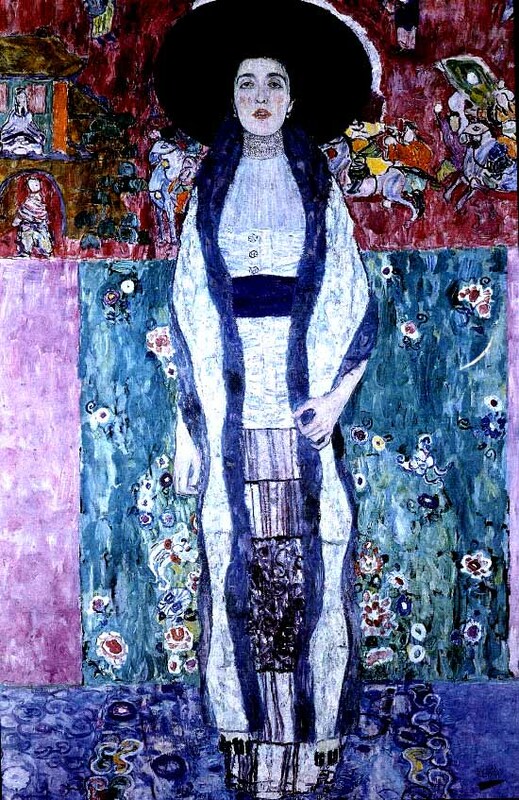 Four Klimts, including Adele Bloch-Bauer II (pictured here) are for sale, as well as a blue-period Picasso. The Times reports that the art market has not been this active since 1990. 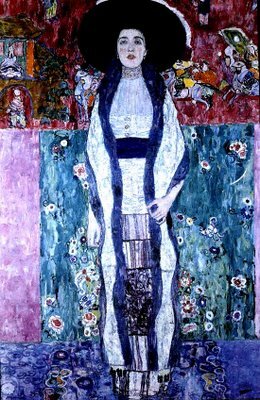 The Klimts are from the Altmann collection, which was recovered from Austria last year after an arbitration ruling granted the heirs of Adele Bloch-Bauer the five pieces after a 7-year legal battle. The New York Times gives a background of the dispute in its story about another Bloch-Bauer portrait which fetched a record $135 million. When Germany annexed Austria in 1938, Bloch-Bauer fled, leaving all his possessions behind, and for the last 60 years, the works have hung in the Austrian National Gallery. The legal dispute even reached the US Supreme Court, in Republic of Austria v. Altmann. That decision upheld lower court rulings which involved the 1976 Foreign Sovereign Immunities Act, which grants foreign nations immunity from suits in US courts. The Court upheld an exception of FSIA which allows suits when property has been taken in violation of international law. The Klimts are exceptionally valuable, and certainly Mrs. Altmann has an excellent claim to the works. However, in terms of the general public, do these works belong in Austria, where they were commissioned? Or are they just as worthy of hanging in a museum in the US? The question is moot I suppose, because the works are Mrs. Altmann's to dispose of as she pleases. But are the works Austrian in character, such that they can only be fully appreciated in Austria? I think not. These are the arguments some antiquities experts make though in support of the return of antiquities to their source nation. I guess I'm not really sure why the argument should be any different between art or antiquities. The NY Times devoted an article to his death and the auction of his estate last week, but unfortunately the article was labeled local news and was only available via their Select Service. Lucky for us, they made an error in the story, and a corrected version is available free here. Kingsland died this spring, and apparently he was a widely known figure in his East-Side neighborhood. His obituary is here. His estate, including a great deal of art, eventually went to auction, leading to the discovery that at least some of the pieces were stolen. As I said last week, the auction has been halted, and the Stair Gallery is attempting to undo the auction, a process that can't be very pleasant for anyone involved. The Harvard Crimson reports that one of the portraits could be a John Singleton Copley, or could be a copyist. The Copley may have been stolen from Harvard in 1968; the work is pictured here. In addition to the NY Times article, there's been coverage in the Harvard Crimson and the Boston Globe. 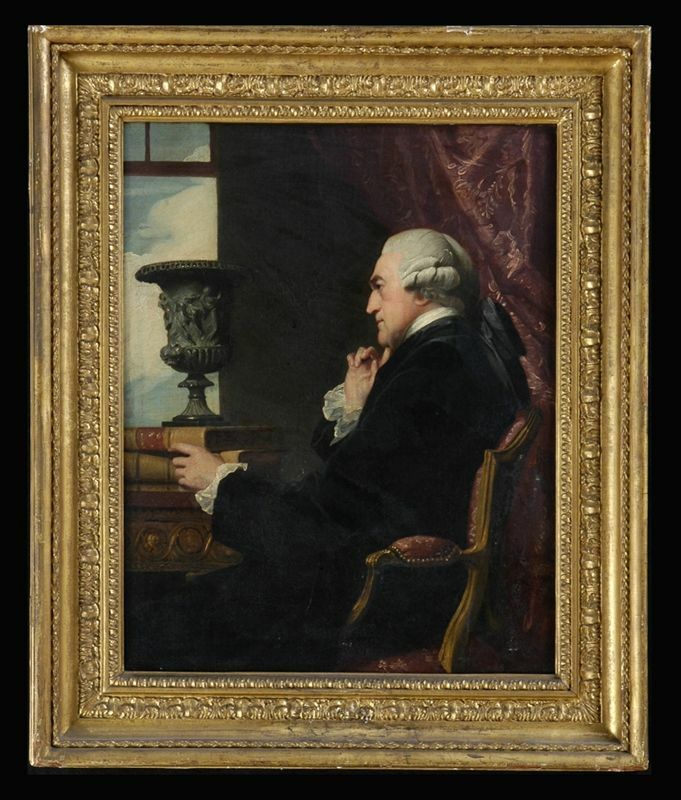 Some have commented that its rare that the Copley went so cheap at auction, but that this may have been due to the fact that one just doesn't expect to find one of his undiscovered works at an auction. The New York Sun also has an article that clarifies how the material was sold. The City of New York sold the Kingsland estate to Christie's and Stair Galleries, who then resold it. If nothing else, the Kingsland estate's misadventures make for an interesting story. They also point out continued flaws in the market. Auction houses are selling objects without a provenance, or chain of title. If we buy and sell cars with a chain of title, why cannot dealers and galleries introduce such information? The answer, I guess, is that it may be bad for business; tradition may dictate against such a thing; or they may not know the information. It may also just be a practical extension of the fact that, they have purchased this estate, and need to sell it as quick as practicable, because they are running a business. 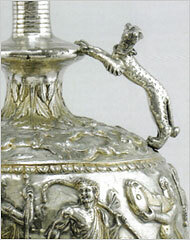 Bonham's has released a slew images of the Sevso treasure to the press. They aren't available on their website, but I've reproduced some of them here, which I've taken off of Dorothy King's blog. For the last week, the infamous Sevso treasure has been on display in Bonham's auction house in London. The New York Times devotes an article in its art section to the exhibition. The private exhibition marks only the second time the 14 silver objects have been displayed, and its not even open to the general public. Some estimates value the 14 sculptures at $187 million. The last display occurred in new York in 1990. 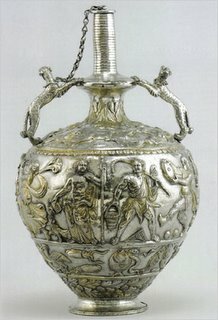 The silver objects are roman in origin, and are believed to date from 350 - 450 A.D. Despite their beauty, the antiquities are marred by controversy. This week's display was certainly made in anticipation of an eventual sale. However, the location, archaeological context and provenance of the find remain unknown. 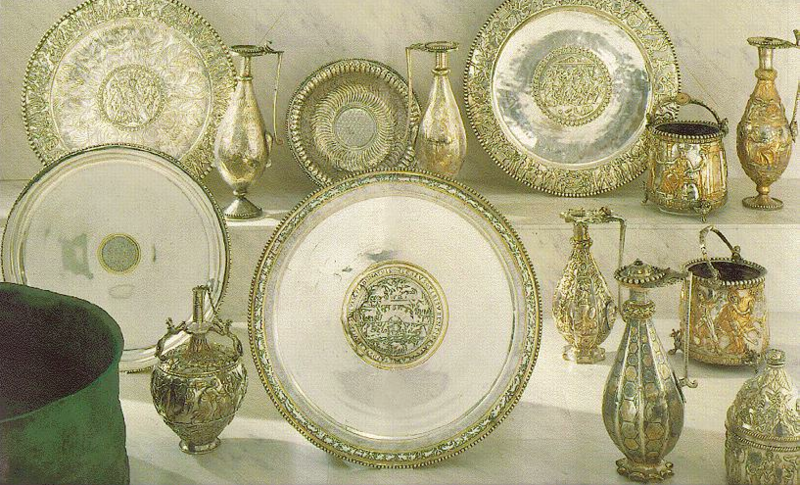 We do know the Marquess of Northampton acquired the objects in the early 1980's. 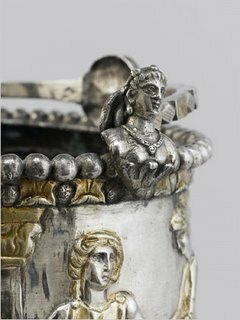 In 1983, 10 of the objects were offered for sale to the Getty museum, however the sale fell through because the export licenses were falsified. One of the difficulties with these items is that their origin remains a complete mystery. 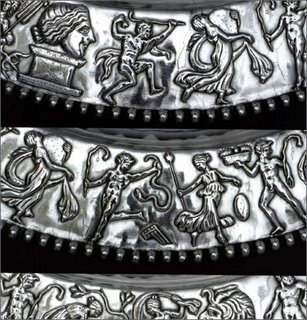 Though certainly Roman in origin, Lebanon, Croatia, and Hungary have all made claims on the objects. There was a lengthy series of legal proceedings. After a 7 week trial in 1993 in the New York Supreme Court (the court of general jurisdiction in New York) a jury found that neither Croatia nor Hungary had established a valid claim over the treasure, and the Marquess of Northampton retained ownership. The exhibition and potential sale have caused quite a stir already. 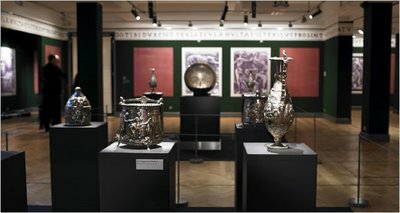 In the London Times, Lord Colin Renfrew, former director of the McDonald Institute for Archaeological Research argued that the display of the works by any UK museum would be unethical, and "It is an affront to public decency that a commercial dealer should do so - even if many archaeologists such as myself, will take the opportunity of going to inspect it." The problem of course, is we know the objects are Roman, but not which part of the former Roman empire they were discovered in. Hungary and Croatia both feel strongly about their claims, but they are unable to establish concrete ownership. There has been an atmosphere of reform in recent years in the UK, with accession to the 1970 UNESCO Convention, the Ministerial Illicit Trade Advisory Panel, the Parliamentary Inquiry in 2001, and the new Dealing in Cultural Objects (Offences) Act 2003. How the UK government will respond to the trade in these objects, which was undoubtedly the result of an illicit excavation should be interesting to watch unfold. Stair Galleries, a small gallery in Hudson, New York has discovered that it was auctioning works which may have been stolen from Harvard University in 1968. The painting, similar to this portrait of 19th century Harvard President, and founder of the law school, John T. Kirkland. 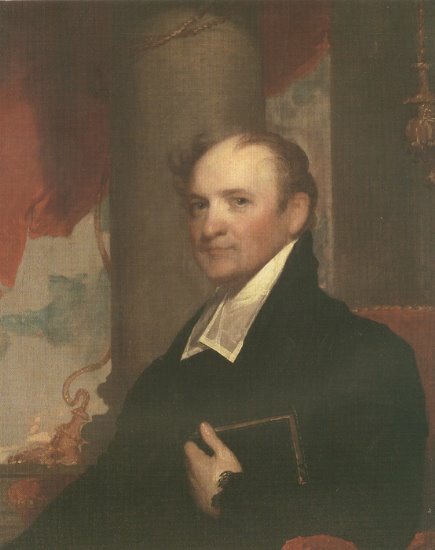 The work resembles this portrait by Gilbert Stuart which sold for $182,000 this summer in Manchester, New Hampshire (pictured here). However, it appears that the work may not be an original Gilbert Stuart painting, according to the Harvard Crimson. The painting was sold for $7,500 last week, as a part of the estate of William M. V. Kingsland. Kingsland had no heirs, and no will. The distribution of his estate was in the charge of a public commissioner, which commissioned the items to Christie's and Stair galleries to auction the objects. 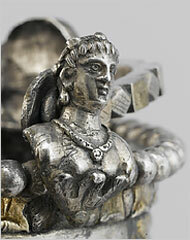 Colin Stair, the president of Stair galleries, halted the sale of 250 objects from the Kingsland estate. The FBI has been investigating the sale, to determine if any of the works have been stolen. A dealer who purchased paintings was the first to discover that one had perhaps been in the Harvard collection in the 1960's. Details are still a bit sketchy, and the only reporting on this I have found has come from the Harvard Crimson. It raises some issues though. What database were being consulted. Did they check the Art Loss Register, or another? 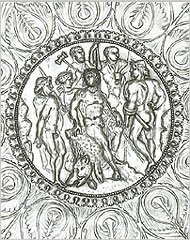 Was the work published in these databases? If anything it highlights the need for a single database, and a need to publish these stolen databases for everyone. On Friday, Swiss Interior Minister Pascal Couchepin and Italian Culture Minister Francesco Rutelli signed a bilateral agreement making it more difficult for objects from Italy to be illicitly traded through Switzerland. I haven't been able to track down the precise details of the agreement, but it seems the deal will require customs officials from both nations to require proof of a lawful export from the other nation before an object is allowed into the country. This agreement may be another upshot of the Getty trial currently underway in Italy. Its also likely a product of Swiss concerns that its art market (valued at $1.2 billion) has taken on a seedy reputation in recent years as a transit state. Switzerland also recently signed the 1970 UNESCO Convention in an effort to change its image. The new agreement is set to come into force sometime early next year. This measure could have a substantial practical impact on the amount of looting taking place in Italy. However one large obstacle is the fact that most antiquities are portable, and can be easily disguised as something mundane with a coat of paint or varnish. Jonathan Tokely-Parry and Frederick Schultz served prison time in the UK and US respectively for disguising Egyptian antiquities in this manner. One of the sad realities of the illicit trade is the fact that customs agents don't have the resources to search every car, or freight container which enters its borders. Though bilateral agreements like this one are certainly a welcome development, more work needs to be done to remedy problems with the market. The New York Times devoted a short brief on the so-called Getty trial wednesday. After a long summer hiatus, the trial of former Getty Museum curator Marion True and art dealer Robert Hecht continued Wednesday in Rome, with the testimony of Fausto Guarnieri, who once worked for Italy's art-theft squad. The statue is only on e of the objects at issue in the prosecution of True and Hecht, who are accused of dealing in stolen artifacts. 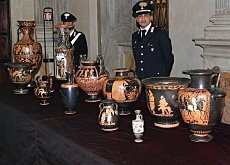 A 1939 Italian law vests title to all unearthed antiquities in the State. The trial is a tremendous black eye for the Getty, as the sculpture is a centerpiece of the museum's antiquities collection in Malibu. True's defense counsel are arguing that the sale of the statue was met with little official interest by Italian authorities in 1988 when the sale took place. 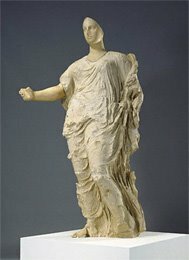 Apparently, the statue was not on the official list of stolen objects when the Getty made official inquiries at the time of the sale. It would have been difficult though, as there was no record of what the statue actually looked like. Prosecutors are relying on scientific data which points to the statue's origin in Morgantina. This trial will of course be watched very closely by museums all over the world with Italian antiquities. Though I failed to grasp it when I posted comments about the decision by the Museum of Fine arts in Boston's decision to return 13 antiquities to Italy, the True prosecution may have been at least part of the impetus behind the decision. 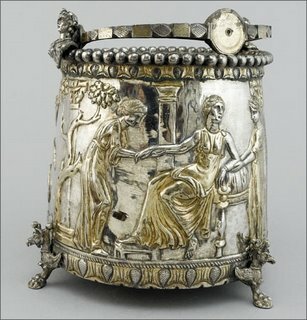 Also, New York's Metropolitan Museum of Art recently returned 21 pieces to Italy. I'm not sure what this prosecution means for the illicit trade. Certainly, it seems likely that museums will be far more careful when they acquire Italian antiquities. However, it seems likely that the looters will continue their work, they just will sell to dealers and individuals rather than museums. Is the public good being served by having these objects in the hands of an individual rather than a museum? Perhaps not; but however nefarious we might believe the actions of True and Hecht were in this case, wasn't there a tremendous value in allowing the public to view these objects? Its the same kind of argument that Greece and the British Museum have been fighting over for centuries in relation to the Parthenon Sculptures/Elgin Marbles. There are no clear answers. However, the Parthenon Sculptures have been resting in London for centuries now, while the Italian antiquites are a fairly recent acquisition by the Getty. Conversely, the archaeological context was lost when the statue was unearthed twenty years ago. However, was there anything in that soil record about Greek civilization that we don't already know? We can't be sure. At the very least, the idea of a museum acquiring a very valuable object which had been looted strikes me as distasteful. It certainly reveals a troubling part of museum acquisition which I suspect the vast majority of visitors are unaware of. In Wednesday's New York Times, we learn that the US State Department has delayed a ruling on whether to limit the import of Chinese antiquities. The delay is unprecedented, and the State Department has been expected to issue the decision this fall. A number of interesting things are playing out here. Foremost is the very public battle between archaeologists and antiquities dealers. First, a bit of background: The United States passed a law in 1983 called the Cultural Property Implementation Act (CPIA). It fulfilled America's obligation as a signatory of the 1970 UNESCO World Heritage Convention (UNESCO Convention). The CPIA allows the US to ban the importation of antiquities from certain nations, via bilateral agreements. As part of the CPIA regime, an advisory board comprised of dealers and academics evaluates requests for bilateral agreements. The State Department has never refused a request like China's. In recent years, 11 nations have asked for and been granted import restrictions of artifacts, including Italy, Mali, Cambodia, Cyprus and seven countries in Central and South America. Until China's recent request, the State Department has never taken longer than a couple of years to come to a decision. The CPIA establishes standards which a source nation must meet in order to qualify for import restrictions. 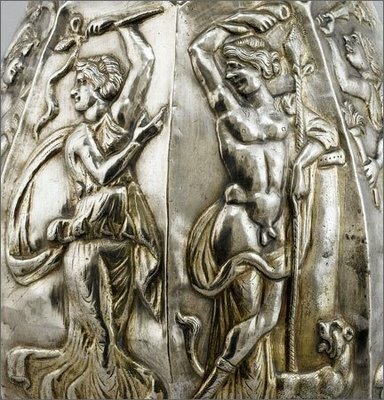 These include showing that the nation has policed the antiquities market domestically, showing other countries are limiting the trade in the objects, and providing evidence that dampening the US market in these objects would significantly impact the effort to prevent pillaging and looting. 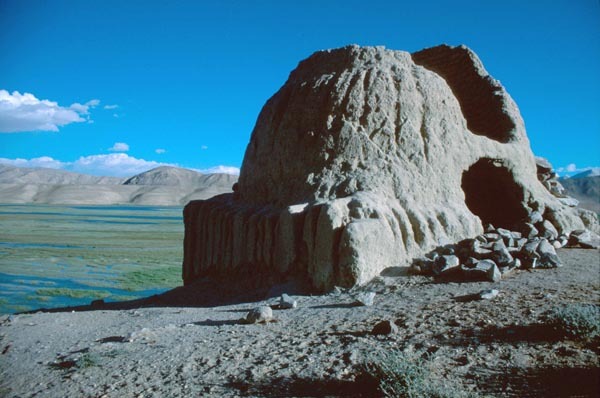 This image is of an early Chinese tomb. Archaeologists are very critical of the art market, as it buys and sells objects which are looted from these sites. Unfortunately when the illicit excavation takes place, the archaeological record is lost. Apparently, China's request is quite broad. It deals with art and coins which are less than 250 years old, which is the threshold age of objects under the 1983 CPIA. There was one public hearing in February, 2005 in which the public was allowed comment. However the State Department has given no information as to how it may reach its decision. The delay is troubling, and it may simply be a result of the market lobby exerting its influence. If the Cultural Property Advisory Committee and the State Department end up restricting the import of these Chinese objects, art dealers may consider challenging the ruling in court. However, they would have a great deal of trouble successfully overcoming the restrictions, as Administrative Agencies are given a great deal of deference by courts. It should be interesting to see how this plays out, and any updates I come across will be published here. In Cairo, the AP reports police detained a group of 5 men who allegedly were attempting to smuggle stolen antiquities out of the country. Curiously, one man was a former state archaeologist, and another was a University Professor. Apparently the five had found five antiquities, and were attempting to sell them. It seems a security agent posing as an arab businessmen offered the men $2 million, but they were arrested. I'd be fascinated to know more of the details of who this 'security agent' is, who they work for, etc. The AP article is quite thin on the details. However, as I learn more, I'll post it here. My first reaction is that these men do not fit the stereotypical mold for antiquities smuggling. Writers in this field often assume much of the looting is done by dealers, thieves and looters. However perhaps that generalization is unfair. Academics and archaeologists may be involved in the illicit trade of cultural property as well. I'd like to devote some time today to the issue of looting following the invasion of Iraq in April, 2003. Specifically, I'd like to point out the perspective of Colonel Matthew Bogdanos, a Manhattan District Attorney, classics scholar, and Marine who led a specialized multi-agency task force. Immediately after the invasion, countless news agencies and press reports claimed that 170,000 Iraqi antiquities had been stolen while American forces stood by and let things happen. Bogdanos has recently published a book about his exploits, Thieves of Baghdad, and has also written scholarly articles, including this one from the American Journal of Archaeology. The strength of Bogdanos' account of the looting of the Baghdad museum is the way he brings a prosecutor's attention to detail to the whole controversy. He creates a time line, and gives his opinion as to what the US military should or should not have done at various times during the invasion of the city of Baghdad. In my view, a lot of commentators took their anger at the invasion, and turned it into blind criticism of how the military should have protected these antiquities . After reading Bogdanos' account, clearly mistakes were made, but not to the extent that initial reports indicated. 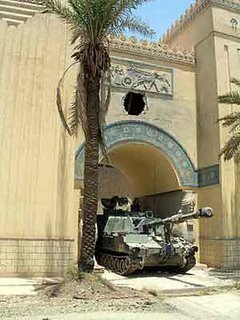 The Baghdad museum itself was rarely open to visitors under Saddam Hussein. In fact, American troops would have likely done more harm to the objects in the museum if they had been more robust in capturing the museum earlier, as there were Iraqi troops inside the museum. This picture shows a hole left by an american tank which was being fired upon from the archway. Granted, there are many arguments against the US-led invasion of Iraq, and the loss of Iraqi cultural heritage is a shining example of what went wrong, just not to the extent initially reported. Who exactly looted the museum remains unknown for sure, but the US military's policy of amnesty for the return of objects helped to bring back a number of priceless artifacts, including the sacred vase of Warka, which is 5,000 years old and considered one of the oldest existing sculptures. Unfortunately many priceless objects are still missing, and are on the FBI's most wanted art thefts list. In the end, after reading Bogdanos' account, the tragedy of recent Iraqi history becomes manifest. This is the cradle of civilization; unfortunately now it is the location of a great deal of violence. Sadly, the recent death estimates which exceed 600,000 illustrate this. A new documentary is receiving limited release, detailing an infamous art heist. Stolen, details the largest art heist in modern history, which took place at the Isabella Stewart Gardner museum in Boston, the day after St. Patrick's day, 1990. 13 works were stolen, including this work by vermeer called The Concert. Apparently the film follows a couple of storylines. One details the work of an investigator, Harold Smith, tasked with finding the missing works. The other, examines the artistic value of these stolen paintings. What exactly the thieves have done with the works remains a mystery, as they are too widely known to be sold on the open market. The film should be fascinating, unfortunately its not being widely released, and seems to only screened in art galleries across the US. allAfrica.com reports today that over 14,000 objects of religious or artistic worth have been stolen from South Africa within the past 4 years. Next week will mark the beginning of an awareness campaign to highlight six of the most-wanted art works, similar to the FBI's list. Ideally, law enforcement will know how to spot these high-profile objects, and check a database compiled by service and customs officials in South Africa. Once again, this is a noble attempt to curb the problems, and it appears much of the art on the list is South African, but more effort needs to be made to consolidate these databases for them to be truly effective. Whether the impetus for that consolidation is the market, NGO's, or UNESCO remains to be seen however. As it stands now, technology is not being effectively utilized. Theft from Leeds, for Dr. No? Last Thursday night, a burglar stole an antique clock valued at £65,000 from Temple Newsam House in Leeds the Yorkshire Post reports. The antique clock, which is 2 feet high dates from the early 19th century. Police are positing that the raid may have been targeted as the thief only took one item. The piece is very elaborate, and widely known, according to the article. Thus rendering its potential market quite slim. The question then becomes, why would the item be stolen if its difficult to sell. As I see it, there are four potential answers to this question. The first, is that a wealthy collector admires the piece, and hired a thief to take it for him. I'll call this the Dr. No situation. This seems the least likely possibility, but the one that strikes a chord with the imagination. Writers in this subject frequently cite the Dr. No as being responsible for thefts, and I admit it makes for good Bond villains, but there has been no convincing evidence that thsi is why people are stealing rare objects. Another similar possibility which seems far more likely is that an unscrupulous dealer may have a similar piece for sale, and if he can establish some excitement around these kinds of pieces, the price for his clock may go up. This is just wild speculation, and assigns a quite sinister tak to arts and antiquities dealers, a habit far too many writers in this field are fond of doing. Third, the thief may simply be trying to kidnap the object. They could then insure its safe return for a generous reward, probably negotiated through a solicitor. Let's assume now that those in charge of the Temple Newsom House are interested in generating more visitors, and a buzz around the clock. Perhaps they even staged the theft, and its sudden reappearance could become quite a windfall for the house, especially if it is struggling financially. This, of course, is wild speculation, and no evidence exists that this kind of activity takes place. Finally, perhaps the market is doing such a poor job of regulating what is and is not legitimate, that it may not be all that difficult to sell this piece after all. This strikes me as the most troubling possibility. Nothing much new on the news front this morning, so I thought I'd point out an interesting piece from Pitchfork's interview of David Byrne. The interview is from July, and coincided with the re-release of My Life in the Bush of Ghosts, an album he created with Brian Eno, which basically took the music of different cultures and looped and mixed it together to create a new sound. The idea was to create an imaginary culture called Afropea, a made-up culture based on the real world. And those are places where the European culture and indigenous culture and African culture all met and lived together, and some new kind of culture and especially music came out of that, that had this incredible richness and strength that then just, boom, exploded and went all over the globe. The most common music that you hear anywhere in the world now basically has its roots in that union that happened in the last century, or in the century before that. He's talking about music here, but the same idea has been seen time and again in the visual arts as well. European impressionists were profoundly influenced by the Japanese watercolors in the 19th century. I think that's a beautiful idea; that we can take these terrible circumstances and out of it comes art, or some kind of human expression. What people create can come together to help people deal with their lot in life, or express themselves, and make something that people want to look at, or read, or listen to. I think this echoes the sentiments of Anthony Appiah's recent work on Cosmopolitanism, in which he didn't argue that the former colonial powers return works to the nations they were taken from (England and the Elgin Marbles is the most recognized example of this). Appiah argues that rather than forcing the British Museum to return the marbles, they should export their own English culture to Greece. That's not to say that Appiah thinks repatriation is a bad thing, just that many are too quick to argue for it without thinking through the logical outcome of such a policy. Cultural Property has a value for everyone, and might there be some value in insuring some objects are preserved and looked avter, and enjoyed by millions of visitors tso that future generations can continue to enjoy the works? In that way, culture can grow and flourish. In the Byrne interview, he discusses an essay he wrote for the New York Times, titled "I hate World Music", in which he argued that if you really listen to music from a different culture and see it as valuable its impossible to see those other people as less than you after you've heard it. I think the same holds true for the visual arts. Music and visual art, and even food flows back and forth from what we can term the former colonial poweres and the former colonies. This flow of culture goes both ways, and can be quite positive. When people discuss ideas of repatriation, and the like, often its in terms of how these indigenous or marginalized cultures have been wronged in some way; and certainly they have. However, a more positive way forward would be to emphasize this two-way flow of culture, rather than blindly punishing the former colonial nations. The Chicago Tribune today has a nice piece on the Art Loss Register. Yesterday, I talked a bit about Mexico's efforts to document its sacred colonial art, in the face of a spate of recent thefts. The more databases there are, the more difficult it will be be for courts to impose a duty on buyers and sellers to check these sources for the object they are buying as part of the good faith requirement enshrined in modern contract law. The piece reveals a number of things about the register. the Art Loss Register played a key role in a 28-year-old case involving seven paintings valued at more than $30 million that were stolen from the Massachusetts home of collector Michael Bakwin. As a result of seven years of complicated, high-wire negotiations with a lawyer who claimed to have been given the paintings by a client, Radcliffe has secured the return of five of the paintings, including a Cezanne in 1999 and four other paintings in January. These high-profile recoveries are a welcome development. A lot of the literature speaks with great interest of the advent of these kinds of websites in stemming the illicit trade in cultural property. And I admit the idea has a great deal of promise, and its one I'm particularly interested in. However, one of Radcliffe's comments strikes me as troubling. The database is not available over the internet, and searchers must comply with the ALR if they find a match. As Radcliffe says, "If we were to put all our information on the Internet, guess who'd spend all their time looking at it? The thieves." That may be true, but what would be the harm in the theives looking at the website. If anything it would serve to make the piece harder to sell. In fact, the way the database works may reveal a troubling aspect of the market; it must be incredibly easy to sell illicit cultural property as long as it is not a high profile piece. The database does not even attempt to limit the potential market for a piece. Rather it depends on individuals to track down a work to attempt to return it to its rightful owner. One interesting issue that the piece does not examine is how much the database charges for its services, including what it may charge to search its database. One welcome aspect though, is that searches are done for law enforcement free of charge. This further strengthens the notion that the database is primarily a tool for claimants seeking the return of their works. In today's New York Times, this piece details the theft of colonial art from Mexico's rural churches. 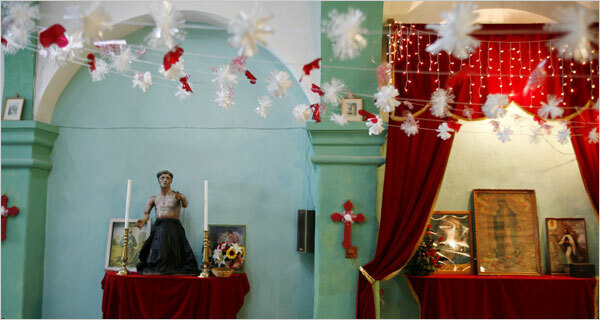 Apparently, theft from churches in Mexico's colonial heartland near Mexico City has become widespread. According to the National Institute of Anthropology and History in Mexico, 1,000 colonial pieces have been stolen since 1999. In response, the Mexican government is attempting to register the nation's sacred art. According to the Times piece, 600,000 items have been inventoried so far. The institute is also preparing its own Web site of stolen art, so dealers and collectors can no longer claim that there is no record of the theft. Apparently, the former French waiter, and superthief Stephane Breitwieser has penned a memoir, soon to be published by French publisher Editions Anne Carrière. The work is titled Confessions d'un voleur d'art (Confessions of an Art Thief). Breitwieser stole an estimated $1 Billion worth of fine art during a 7 year spree, including this work, a 16th-century painting by Lucas Cranach the Elder, "Sybille, Princess of Cleves," which has been valued at between £4.2 million and £4.7 million. Most incredibly of all, his mother shredded canvases and threw a number of the pieces in a canal after learning of her son's arrest. A Swiss court has sentenced him to 4 years, and a French court has sentenced him to 26 months. Apparently he's kept himself busy writing about his exploits. It's worth noting the way a work's fame and theft often go hand in hand. The most famous painting in the world, the Mona Lisa did not become famous until it was stolen in 1911. 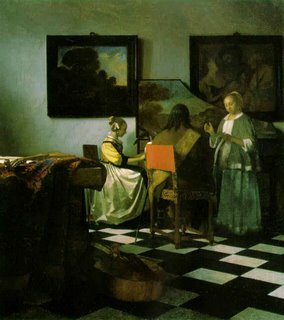 Art theft captures the imagination, and often leads to greater interest in a work. It's hard to understand exactly why theives like Breitwieser steal art. They may be seeking fame, trying to earn money, overcome by their love of beautiful things, or filling an order for a wealthy collecter who wants a work for their own private use. Edward Forbes Smiley III, a 50-year-old former Princeton divinity student is slated to be sentenced in US District Court on October 17, after pleading guilty to the theft of cultural property. Between 1998 and 2005 he admitted to removing 97 maps from institutions and public libraries in the United States and the United Kingdom between 1998 and 2005. The maps are worth an estimated $3 million. One of the works include this 1578 Flemish map valued at $150,000. He was caught attempting to steal the map from the Yale Beinecke Rare Book and Manuscript Library last year, after a librarian discovered an exacto knife on the floor and called the police. Initially, one wonders at the utter lack of security at these libraries and institutions. How could someone just walk in and slice things up? On the other hand, Smiley must have acted and played his role well. He was and Ivy-league-educated map dealer, and it seems safe to assume that he looked and acted like he belonged in these places. Also, it may be tempting to throw Smiley under the bus and impose a very strict sentence. However, he did cooperate with authorities, and nearly all of the maps are going to be returned to their owners. Predictably, Library and Museum groups are urging a very stiff penalty for Smiley to discourage behavior like this in the future. In other news, last Wednesday, 15 paintings worth and estimated £300,000 were stolen from the Clark Art Gallery in Hale, just outside Manchester, England. A reward of £250,000 has been offered for information leading to the return of the paintings.